Commodore Business Machines (aka cbm), Santa Clara, California, USA. Commodore was founded in 1958 in Toronto, Canada, as a typewriter repair company, by Jack Tramiel and Manfred Kapp. The company was bought in 1966 by Irving Gould, a Canadian financier, who instructed Jack Tramiel to take the company into the fast growing calculator business. Commodore marketed mechanical ten-key add-lister machines, and re-badged Casio desktop electronic calculators before it moved to manufacturing its own large range of hand-held electronic calculators. In the early 1970s Commodore set up calculator assembly plants in the Watts district of Los Angeles, U.S.A., and in Eaglescliffe, England. 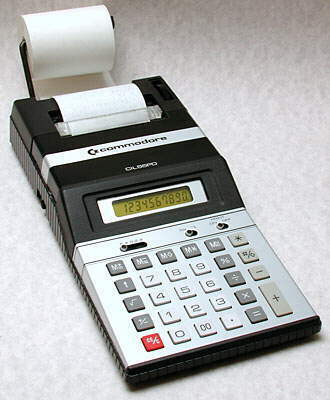 Although based in Canada and the U.S.A., Commodore calculators sold particularly well in Europe, due to better marketing by the company divisions based there. In 1975 the Commodore factory in Eaglescliffe, England, was reported to be producing 6 million calculators each year and Commodore had 30% of the UK market. The labour cost of assembling a simple model in 1976 was £0.10 Sterling (about US$0.23). However, by the mid-1970s, like many other companies, Commodore was severely affected by the plummeting price of electronic calculators and the resulting difficulties of making a profit from them. The Journal New Scientist, in November 1975, reported: "Commodore is struggling to survive. Two weeks ago the firm reported its end of year results, which showed a $4.3 million loss on sales which were up 12 per cent over the year to $55.9 million. Commodore is now pinning most of its hopes on the European market, which is nowhere near as stagnant as the American market has been lately." One way that the company used to overcome this was to buy up a semiconductor manufacturer in order to gain vertical integration of manufacture of the whole calculator, as explained in New Scientist in September 1976: "Commodore takes over chip manufacturer MOS Technology Inc. of Pennsylvania, after being closely associated for some years, though also subcontracting designs around the world. Commodore, the Canadian owned American based calculator manufacturer which markets under the name CBM in Britain, has announced its intention of entering integrated circuit component manufacture with a recent take-over. Unlike several of its competitors (such as Rockwell, National and Texas Instruments) who are primarily microcircuit manufacturers but who have also integrated vertically upwards into end-products like calculators, Commodore is integrating downwards in order to protect its supply of components. Commodore, quoted at $60 million on the New York Stock Exchange, has acquired 100 per cent of the equity of MOS Technology Inc of Pennsylvania in exchange for a 9-4 per cent equity stake in Commodore. MOS Technology is privately owned and valued at around $12 million. It has an integrated circuit manufacturing plant in Valley Forge, Pennsylvania. MOS Technology has been closely associated with Commodore for some years. The integrated circuit chip that went into CBM's successful SR36/37 calculator came from MOS Technology, as does the current chip for the SR7919D calculator (a model which is rumoured to have around 25 per cent of the UK scientific calculator market) and others of the current CBM range. But the firm not only makes integrated circuits for calculators, it has also lately launched a video game chip for four players and is currently marketing a successful microprocessor. At present, Commodore produces the art-work for its calculator chips and subcontracts the chip manufacture to outside plants around the world with spare capacity. The recent purchase of factories in the Far East has enabled it to assemble electronic watch modules by this subcontracting method. But as the up-turn in the economy begins to effect the consumer electronics industry, less spare capacity is becoming available for this type of subcontracting. When considered along with the additional recent purchase of an LED display manufacturing facility, Commodore now has a completely integrated operation." Acquiring a semiconductor company made good sense since Commodore then had direct control of the design and supply of the calculator circuits it needed and would also profit from what was one of the more expensive components of a calculator. In 1976 Commodore International Limited (CIL) was created in the Bahamas with the following divisions: Commodore Business Machines (US), Commodore Canada, Commodore Germany, Commodore Hong Kong, Commodore Japan, Commodore Switzerland, and Commodore UK. 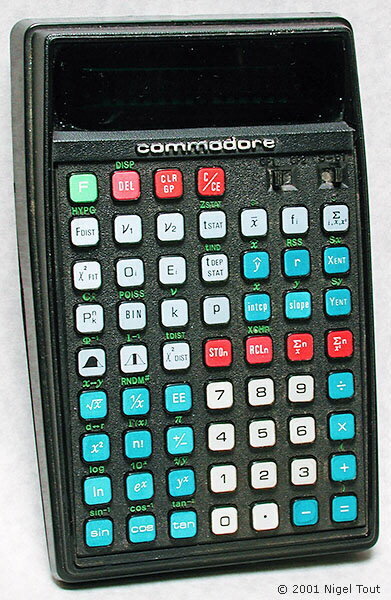 In the late 1970s Commodore was noted for a range of specialised calculators having many features, such as the S61 statistical calculator, and introduced several LCD models. It had also acquired an LCD manufacturer, Eagle Picture. It decided to leave the calculator business in 1981 and concentrated on personal computers, including successful models such as the Commodore PET, Commodore C64, and Commodore Amiga. Commodore went bankrupt and closed down in 1994, having lost its way in the development of its own personal computers and been hit hard by the rise of cheap IBM-PC clones. The fascinating history of Commodore can be read in the book 'Commodore: a company on the edge' by Brian Bagnall, published in 2010 by Variant Press. This desktop calculator dating from 1971 is quite a compact model for this time. Made in Japan. A very common 7-digit display calculator from the mid-1970s. 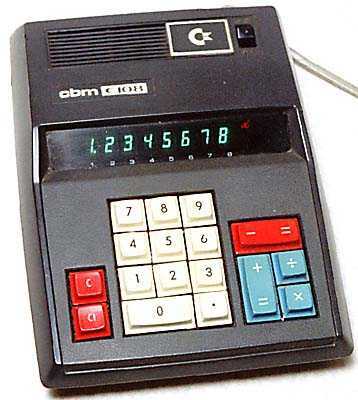 This statistical model is one of the specialised, multi-button calculators that Commodore produced in the mid-1970s. Note that CIL stands for 'Commodore International Limited'. This is one of the later Commodore models with LCD display and printer. The LCD has the yellow filter, typical of early LCDs, to protect it from damaging UV rays. For further photographs of Commodore calculators see the Calculator Photo Library on this site. "Calculator guts on one chip", New Scientist, 5 February 1976, p288. "Coming of age in the calculator business", Nicholas Valéry, New Scientist, 13 November 1975, pii-piv. "Calculator maker integrated downwards", New Scientist, 8 September 1976, p541.